Word of mouth is a good thing, right? 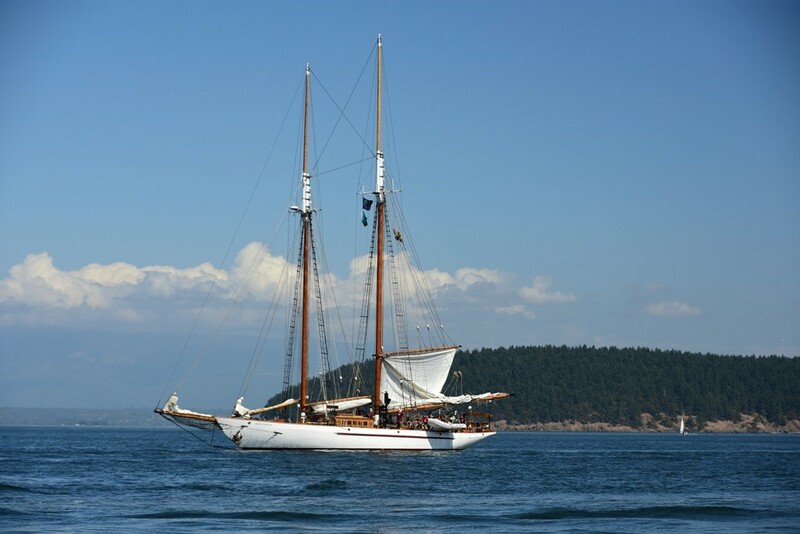 A fellow sailor told us of a pretty anchorage between Double Island and Orcas Island, so we planned our first visit. 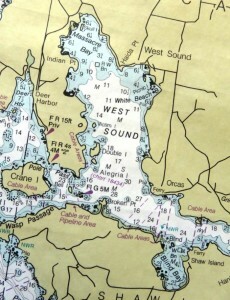 The nautical chart aboard our sailboat shows two adjacent islands connecting at low tide. Locals refer to them as Big Double Island and Little Double Island (aka Alegria Island). 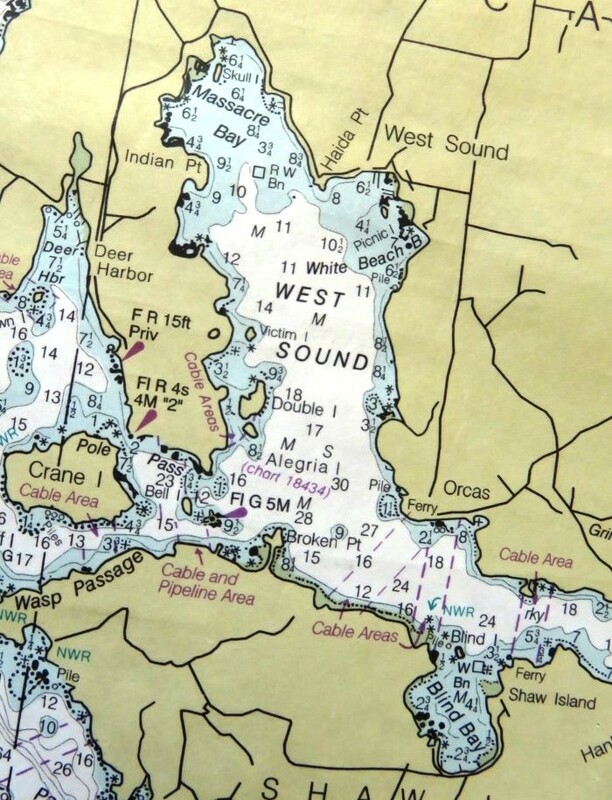 Sailing north into West Sound at the eastern end of Wasp Passage, we skirted the west shore and dropped anchor south of the shallow pass between the Double Island group and Orcas Island. Pretty anchorage, yes, but scant protection if a strong south wind should blow and shove us onto a lee shore. Soon wakes from ferry and boat traffic transiting Wasp Passage rolled us from side to side, confirming our suspicions why we had the anchorage almost to ourselves. 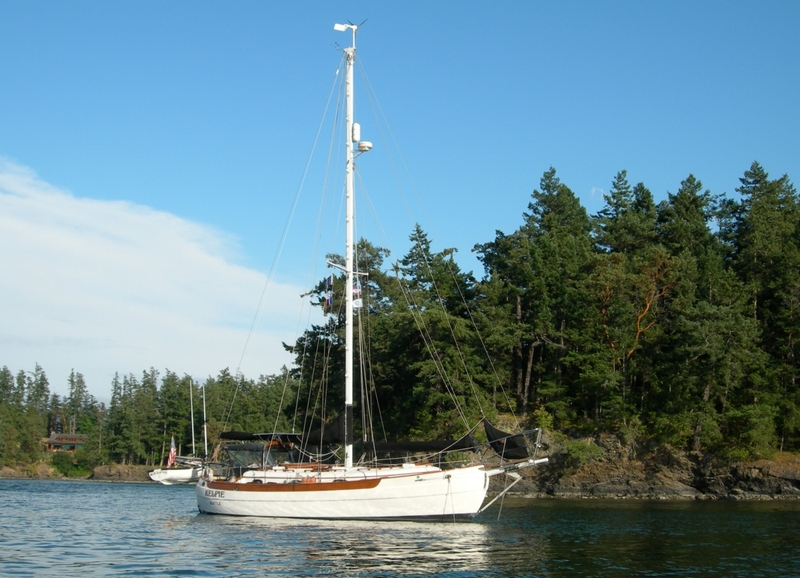 Later, we learned that most boaters and a few charter vessels, like the S/V Adventuress, favor anchoring north of the shallow pass and south of Victim Island in a fairly well-protected cove. From experience, we recommend this anchorage in the summer, but only on a temporary basis during light wind and good weather in the winter. Holding ground is suitable, but we could hear the anchor chain dragging over rocks as our boat drifted in the slight current created by the rise and fall of the tide. On rare occasion, our anchor or chain have snagged on a rock and we’ve freed them by pulling the boat in different directions using the engine. But don’t let that stop you from anchoring in this pleasant cove. We’ve met new sailing friends and we’ve been entertained. Once kids from Four Winds Camp north of Victim Island boarded the camp’s sailboat dressed as pirates and serenaded us with sea shanties. And we still joke about the time the S/V Adventuress hosted a girl scout troop aboard, dreaming they were below decks baking cookies for all of us yachties. Right! One of the benefits of anchoring at Double Island is we can leave the larger boat and go exploring in the dinghy. In our case, we own a small 10-ft. inflatable with a 15-hp. outboard engine. 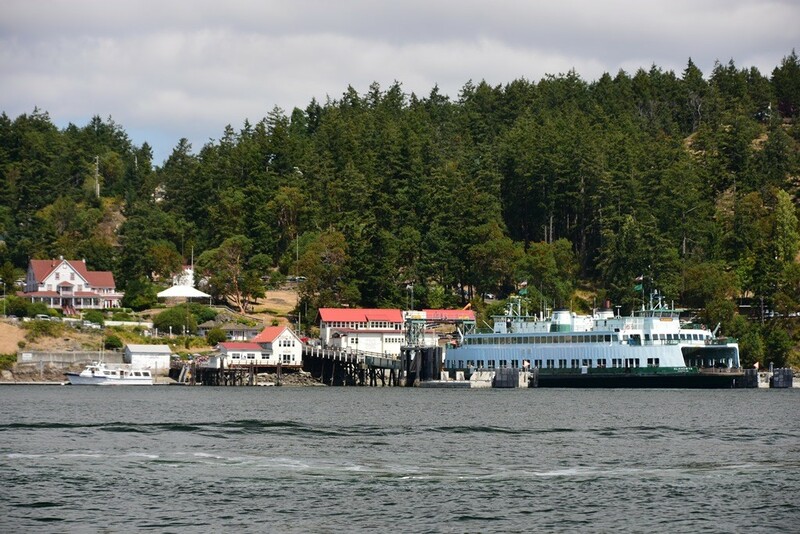 In good weather—meaning flat water rather than lack of rain—we can reach Orcas Landing to rendezvous with guests arriving by ferry, shop for groceries at the market, and drop a scenic San Juan Islands postcard at the post office. If we’re hungry for island cuisine, there is the historic Orcas Hotel‘s dining room or cafe and a few other eateries. Tourists browse the handful of souvenir shops while they wait for a ferry or board the Orcas Express to take a whale watching cruise. Operated by Orcas Island Eclipse Charters, the tour boat is moored at the public county dock next to the ferry where we tie our dinghy. Residents and visitors alike shop for groceries and picnic items at the Orcas Village Store. Very handy, when you are anchored at Double Island. A few minutes’ ride across Harney Channel, the unique, old-fashioned Shaw General Store (aka Little Portion Store) with its vintage post office is worth a visit. Local residents congregate here to shop and pick up their mail, exchanging warm greetings and islander news. 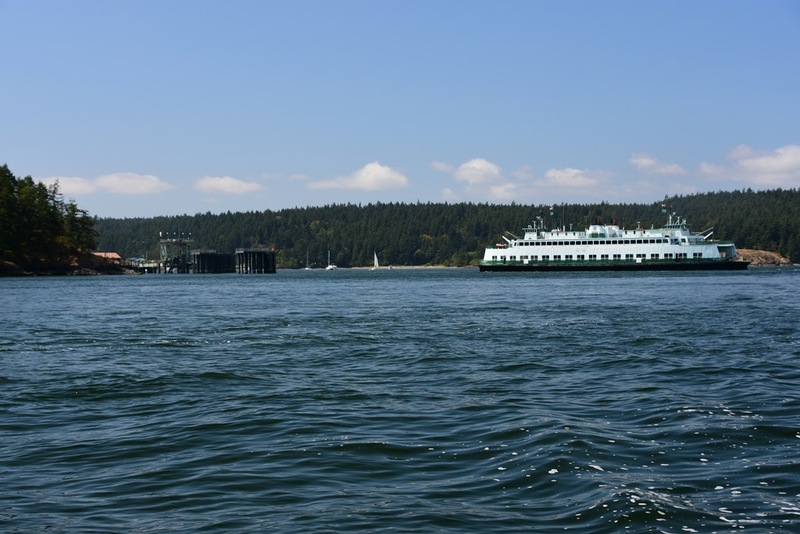 I was surprised to learn the mail is retrieved by boat from Orcas Landing, where a Washington State Ferry has delivered it from the mainland. 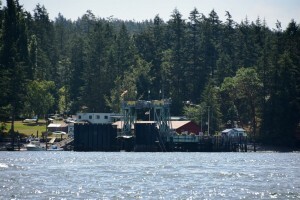 The Shaw Island mail boat is tied behind the larger boat by the ramp in the below photo. 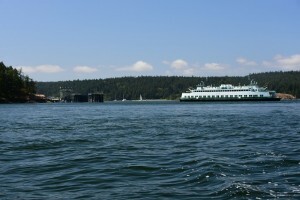 Both boats are moored with bows facing the channel to prevent propeller wash from incoming ferries and wakes from passing boats to sweep over the transoms. Visitors with kayaks and dinghies can land at a small pebble beach on the Blind Bay side of the ferry landing. Otherwise, customers are allowed to tie up at the store’s small private marina. Formerly operated by Franciscan nuns, the store still offers a wide variety of organic foods and local handcrafted gifts. In Part 2, I’ll share about Deer Harbor, another destination we enjoy traveling to from our anchorage at Double Island. Thank you for reading! This entry was posted in Double Island, San Juan Islands and tagged Blind Bay, Deb Garland, Deb Garland's Scripture & Story, Deer Harbor, Double Island, Double Island - Exploring the Central San Juan Islands - Part 1, Four Winds Camp, http://www.blog.debgarland.com, http://www.debgarland.com, Isaiah 55:6, Little Portion Store, Orcas Express, Orcas Hotel, Orcas Island, Orcas Island Eclipse Charters, Orcas Village Store, S/V Adventuress, S/V Kelpie, Shaw General Store, Shaw Island, Shaw Island Ferry Dock, Washington State Ferries, West Sound. Bookmark the permalink.